When I went to the Stockton Market a couple weekends ago, my friend and I had breakfast at Meil’s before doing our marketing. This was the pear chutney and cheddar cheese omelette. There are lots of accompaniments to choose from (you get 2). I chose fruit (note the yellow raspberry in the saucer), and very good multi-grain toast. 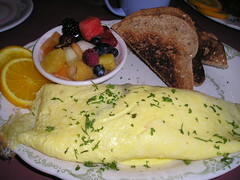 I ordered the omelette because when I first learned to make them, thanks to – who else- Julia Child -, I loved to make jam omelettes. The omelette at Meil’s (a bit pricey at $13) was good, but the chutney got a little watery. However, I was so glad it wasn’t overdone, most omelettes I see go by in restaurants are much too done (i.e. browned) for me, so I almost never order them. 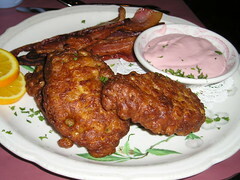 My friend had her favorite, the corn fritters with raspberry mayo ($9.50) that you see below. She added bacon for $5 and that was great bacon! They get it from Maresca’s, the well-known butcher shop in nearby Sergeantsville. We drove by there on our way home, but they are closed on Sunday. The corn fritters, which appear to be deep-fried, but really were not greasy, were good. Not sure if I like the raspberry mayo, but apparently it’s a hugely popular item at this friendly, funky, restaurant. They have a tempting bakery case just inside the door, too. Next time, Maresca’s for sure! making me homesick for NJ! Meil’s was one of my favorite lunch meeting places and the corn fritters with raspberry mayo my favorite thing to eat….have never been able to get them to divulge their secret to the fritters despite many efforts talking to the kitchen. Thanks for your comment! Maybe try writing a letter to Bon Appetit, for their montly r.s.v.p. column where they obtain recipes for readers from restaurants?